Majors at Williams are placed into 15 groupings on the left side of a circle; possible career paths are in 15 groupings on the right side. Each of the college’s 15,600 alumni has an arc going from the left side of the circle to the right. Those with double-majors have two arcs on the left (one from each of their majors, each arc of 1/2 thickness) that combine into one resulting career choice. 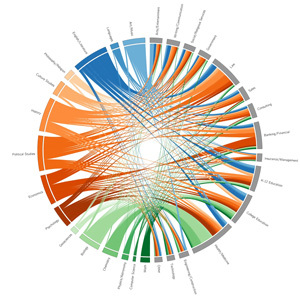 A tutorial on phylogenetics led by Satyan Devadoss, associate professor of mathematics, produced something of an unexpected outcome: a visualization of the relationship between college major and career path for some 15,600 Williams alumni. Devadoss encouraged his tutorial students to devise their own final projects for the course, which blended math, biology, computer science, statistics, and more in learning about how to construct visual representations of various types (and large amounts) of data. Hayley Brooks ’12 and Kaison Tanabe ’13, who both had some background in computer science, decided to take on a subject that weighs heavily on the minds of college students, prospective college students, and their families, namely: How does one’s choice of major in college affect career path? The pair got the alumni data they needed—plus a lot of support—from Michael Reopell, director of advancement information systems, and from there set out to configure and program the most useful, readable graphic presentations of the records. Using software initially developed for visualizing genomic data, Brooks and Tanabe grouped majors into 15 categories, to occupy one half of a circle, and did the same with the many career fields represented in the college’s alumni database, setting them up in 15 categories on the other half of the circle. Lines from majors to career paths tell the story visually in a way that Brooks and Tanabe say wasn’t possible to see in a spreadsheet. “It really doesn’t matter what you major in,” Brooks said. “You can be a history major and go work in information technology.” The strongest correlation showed up between natural sciences (especially biology and chemistry) and health/medical careers, but mostly the visualizations told a reassuring story. “You can study what you love and then go do what you want,” Devadoss said. Devadoss and his students are now exploring ways to bring visualization to academic institutions across the country. Tanabe is also working with Devadoss this year to to examine wether having a double or triple major makes a difference in career path, as well as whether the relationship between major and career path may have changed over time. Check out the details of the project, including the paths by division and by major, on Devadoss’ website. You can also read more about the project in Williams Magazine.